Every person building a product is ultimately designing for behavior change. Regardless of the type of problem your product is trying to solve, you need to (1) capture the user’s attention, (2) convince them to engage with your product or service, and (3) compel them to take action (in a way that, hopefully, improves their life). In the simplest sense, you need them to do something different from what they normally do. At Omada Health, we’re designing a program that helps people build healthier habits, so they can reduce their risk of obesity-related illness. To succeed, we must empower people to change how they eat, move, sleep, and manage stress. We regularly ask them to make the more difficult and less gratifying choice in the short-term in order to realize benefits over the longer term. It’s a messy, but rewarding, problem. Here are 3 tips that Omada uses to improve the likelihood that the behaviors we’re trying to encourage stick. Omada’s design process begins with research grounded in behavioral science, where we identify techniques that have been shown to work clinically. The research findings act as a springboard for ideation, helping us ensure that we’re starting with ideas that aren’t just innovative and user-friendly, but are also evidence-based. You don’t have to have a PhD in behavioral science (or a teammate who does) to start your design process with science. You can begin by familiarizing yourself with existing frameworks, and understanding how some of the core components of behavior change theory could be applied to your problem space. 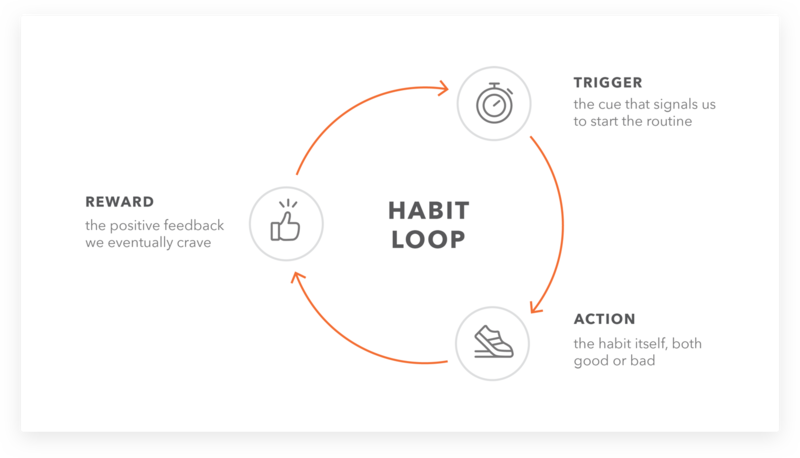 For example, multiple behavior change frameworks leverage the idea of a “habit loop,” which suggests every successful habit operates cyclically with 3 core components: a cue, a routine, and a reward. To put this framework into practice, you could structure your next brainstorm around (1) what triggers to use to remind your user to start the habit (existing or new), (2) the routines or behaviors you’re looking to create, and (3) how you’re going to reward users when they’ve completed the routine. There are reams of studies from behavioral economics and health that can be broadly applied to behavior change problems in other spaces. Here are a few additional behavior change models to get you started. Seeding your ideation sessions with research-proven techniques can hypercharge the creative process while ensuring that your solutions will actually help people achieve the intended behavioral outcome. There is no one-size-fits-all approach to behavior change, so it's critically important for designers to think systematically about how the product can be personalized to the needs of the individual. At Omada, we’re building a system for health behavior change that is constantly learning about our participants’ struggles, interests, and successes. This will enable us to anticipate and deliver the kind of support, education, and guidance each individual needs to lose weight and live a healthier life. We are continually experimenting to discover how user-inputs (meals tracked, steps, survey responses, coach or group messages) can generate value-added outputs (educational resources, coach advice, or recommended challenges). We obsessively measure the effectiveness of each output against predetermined goals. Did the participant view the resource? Did they comment on it? Did their meal quality improve thereafter? And because the outputs don’t always prove effective, we make sure to have a backup plan: other variations of content, resources, or advice that could be more helpful. 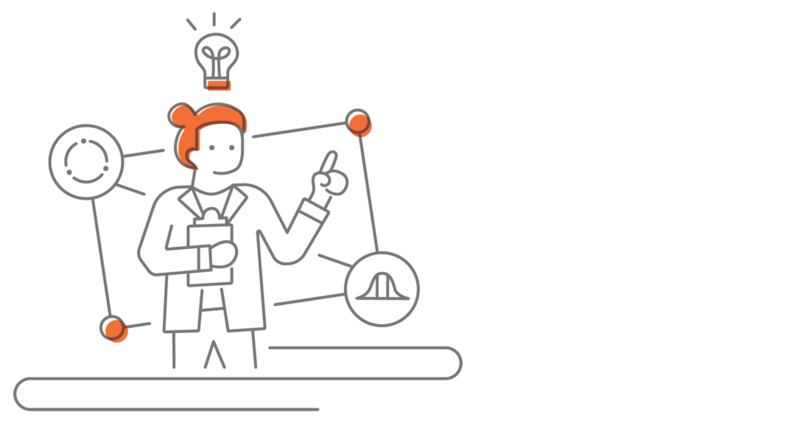 Your behavior change product should constantly be capturing feedback, both passively (through user interactions) and actively (surveys and ratings). Based on this feedback, your system should be able to (1) identify the type of user and their unique needs, (2) determine the right content or tool from a variety of available options, and (3) deliver the experience or content that is most helpful, given their needs. Step 3 can be done via basic, hard-coded logic (“if user inputs this, then deliver this piece of content”), or a sophisticated, machine learning model. Ultimately, the goal is to create an environment that nurtures people’s willingness to try new things (and rewards them when they do). As people attempt new behaviors and successfully find things that work, they build self-efficacy. In other words, they gain confidence in their ability to change. Thoughtfully designing virtuous cycles into your product can help build trust with your user, and give them the support they need to make the hard decisions that change their lives. You can’t just jump straight into getting someone to change the way they’re used to doing things. A tactfully designed “on-ramp” helps user’s get mentally prepared for the process of trying out new behaviors. It also creates opportunities to gain the user’s trust, and help them identify and deepen their motivations for engaging with your product or service. At Omada, we’ve built a deliberately long on-ramp that typically starts with our marketing materials, landing pages, and risk screener. Once accepted into the program, the participant segues to “week 0” onboarding, guided by their personal health coach. 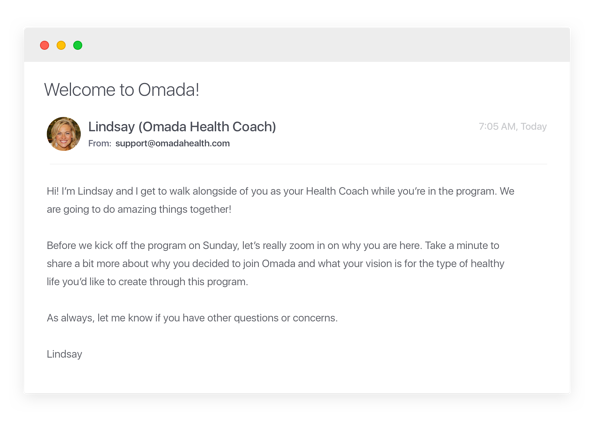 These early touchpoints allow us to connect with the wide variety of individuals considering our program, and ensure that each trusts that Omada is a safe place to build a healthier lifestyle, one habit at a time. As you look at your product’s on-ramp, think about early interactions that might teach the user something new, establish your company as an expert, and/or allow them to provide information that will help you cater the product to their unique needs. Most importantly, consider how you can help them see the value of the change you’re asking for. One best practice is to reward your users with helpful feedback as they’re entering information to setup their account. This builds rapport, and sends a clear message: The efforts they make to engage with your product or service will result in a better, and more personalized experience. It also starts a habit loop that you can build on with every interaction. Our users’ expectations are evolving. Gone are the days where basic utility and usability are enough to keep them coming back. More and more, our users expect their products to understand them, to provide insight, and adapt to meet their unique needs. Building products that deliver on these expectations requires evolving the process and tools with which we design. We have to be constantly striving to build experiences that are as dynamic and multifaceted as the users that interact with them. The bar is even higher for for those of us who are designing to fundamentally change the habits and behaviors of our users (and, really, that’s all of us). Starting with science: Leverage proven frameworks from behavioral science as a starting point for design, and a springboard for idea generation. Designing for variability: Create a system that is constantly learning about your users, and includes a variety of options to serve them based on their needs. Building an on-ramp: Construct a pathway to your product that builds trust with your user, deepens their motivation to engage, and rewards them for their effort. Thanks to Carolyn Jasik, my partner in crime on the on the clinical team for your input, and an especially big thank you to Natalie Harmon for your illustration magic.